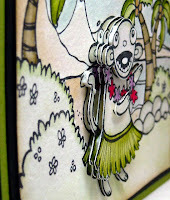 Okay, so I'm not really on a tropical vacation, but I'm using some fun DoodleFactory stamps for today's post. I'm also using one of the new techniques from the August Technique Junkie Newsletter called Level Up - it really adds a ton of dimension to your project. There's a lot of cutting involved, but the end result is so worth it! Not a TJNL Subscriber, click here for more details, just about all the techniques you see me use in my posts are from the newsletters. See the bottom of my post for some special pricing! 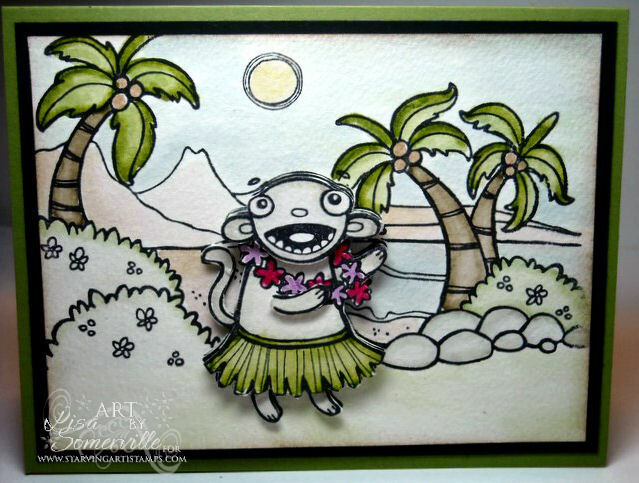 To create my scene, I used images from StarvingAtistamps DoodleFactory Tropics and Set the Scene Backdrops. The images are stamped in Black Archival on Watercolor paper, and colored with the Marker Watercoloring Technique. Moki was added using the Level Up Technique. Technique Junkie Newsletter - special pricing! Blog Special! Two years of online-only access for only $18.88! You will have access to the February 2010 through December 2011 issues of the Technique Junkie Newsletter -- with over 180 technique tutorials in step-by-step format with one password access! My passwords don't expire, either -- so you will have those tutorials as a resource as you need them. To order, send Pat an email for an invoice through PayPal (phuntoon@optonline.net) or send a check to her at the address below. You know Lisa, with some of the rain stomrms you have received, all you need is the Palm Tree and you are in the Tropics! Your card gave me a big smile! Just too cute and it sure does pop! Hi Lisa, I stopped by to say Hello and check out your blog. I can't believe i've never been here before. You always leave such nice comments on my blog so I figured I owed you a visit. 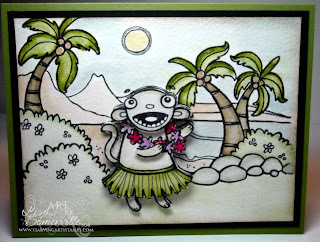 Your monkey card is adorable, I love those layers; so fun! Have a great day! Hi Lisa! Savannah's doing a giveaway and invited us to come leave some love at one of the PDCC DT blogs. So glad I decided to check yours out! You've got some awesome creations on here! I'll be following now. :) TFS! 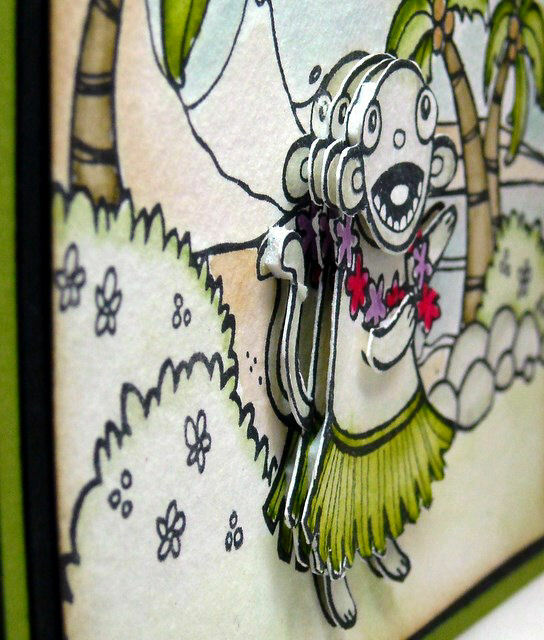 Adorable, is that you in the hula skirt? Kinda' looks like you? lol Luv this tech, you really did a FAB card. this is amazing, such a fun card...have a fantastic week! Great card! This card was the perfect image for this technique! I just wanted to let you know, I ordered the newsletters and they are fabulous! I love how Colorful they pics are and how clear the descriptions are, too! Fantastic card-is that what you are doing around the campfire this week huh? he he! This is such a cute card! Love the dimension you've added!!! IT was great getting to meet you in person!! Lisa this one cracked me up. Love the little guy. That technique is perfect for him.